The Hawk sets the bar high for a tactical pocket knife with a modern twist. With a 3.125" blade of 440 Stainless Steel and a brushed stainless steel handle, this is a sleek design that fits comfortably in your pocket. 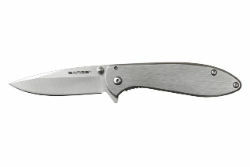 Featuring a spring for swift assist opening, the knife opens smoothly and quickly.